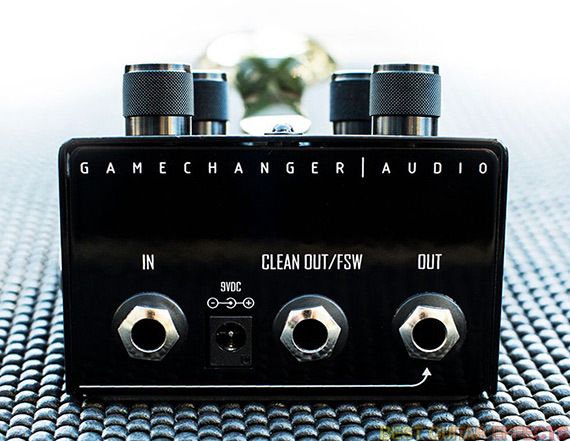 The Gamechanger Audio Plus Pedal is a new kind of audio processing engine that offers piano-like sustain effects for guitars and other instruments. The distinctive, sophisticated appearance and ergonomic design put the Plus Pedal in a class by itself; it’s sure to invite stares from all the gearheads. Now, of course, there will be some comparisons to pedals like the EHX Superego and Freeze, but the Plus Pedal is decidedly different. Some things are obvious; the actual “switch” is very different. Instead of a stomp switch, you get a great piano-like sustain pedal. This pedal works similar to an expression pedal in that a “half-press” makes it behave differently than a “full-press.” Can’t do that with a stomp switch. You get real-time feedback of half-press vs. full-press by watching the LED brightness. There are some things that are also different under the hood. The actual technology within the pedal is much different than that of other pedals on the market. The Plus Pedal is based on a new method of digital sound processing called Real Time Audio Sampling and Looping (patent pending). Instead of creating tones using an oscillator and filter based synth engine, Real Time Audio Sampling and Looping works by creating a smooth, circular loop out of a source signal that is recorded as you go, sampling only the last segments of your incoming notes or chords. These tiny bits are sampled in real time and looped together to create a seamless, warm and responsive sustained tone. Blend (how much): Controls the volume of the wet signal produced by the Plus Pedal. The 12:00 position is an exact 50/50 blend of wet and dry signal. It has a very convenient indent in the potentiometer’s path as you turn it. Sustain (how long/how many): Now, this is kind of a magical and busy knob. I will do my best to describe it in detail. First of all, the Sustain knob changes its functionality when you switch from Single Mode and Group Mode. In Single Mode: The Sustain knob allows you to control the behavior of the hold function while the foot-pedal is pressed. When set to minimum, you will get the natural decaying properties of a ringing guitar string. Whereas, when set to the maximum, signified by an infinity (∞), the Sustain knob will keep the sustained note/chord completely static for as long as the foot-pedal is pressed without applying any frequency filters on the top end. In Group Mode: The Sustain knob allows you to control the number of sustained layers allowed to be played simultaneously. You can choose between 1 and 5 layers. As you rotate the knob to choose the number of layers, watch for the LED to blink once for each number from 1 to 5. Rise (fade in): Sets the fade in speed of new sustain layers generated by the Plus Pedal. A minimum setting will let you bring in new tones instantly, while the maximum setting will result in extended, gradual swells. Try somewhere between nine and noon for a starting point. Tail (fade out): Adjusts the amount of spillover after you’ve released your foot from the pedal. The maximum setting here also features an infinity symbol (∞) and when it is set to this point, the layers will continue to stack up on top of one another (up to five layers) and create rich, harmonic soundscapes. There are several useful ins and outs on the pedal. Input and dual output jacks and 9v power jack are conveniently mounted up top. On the right side, you have options for a separate effects loop as well as two switches that allow for additional control. One switch allows for Group or Single mode. In Group mode, the pedal will collect whole groups of audio layers. In Single mode, it will focus on the most recent note. A second switch allows for Mix or Split on the output. In Mix mode, the more common mode, your wet and dry signals are mixed together on the output. In Split mode, only the isolated wet signal is generated by the plus pedal. There is even an option for the Clean Out/FSW output to harness your unaffected dry signal at all times. I can see this being extremely useful in a recording studio setting. A note regarding the size of the Plus Pedal. It’s about 2/3 the size of a standard volume or wah pedal. In my efforts to keep my pedalboards really small these days, I was struggling to figure out where to put the Plus. I then learned that it’s best to put it first in your chain. Therefore, I don’t put it on a board. I just carry it with me and plug it in between my guitar and my board. It draws 130mA so it can’t use a battery, which would have been convenient, so I just keep a longer power lead available on the board and plug it in that way. I like it next to my board like that. It’s kind of handy to have it off to the side where you can angle it to work more ergonomically for you. 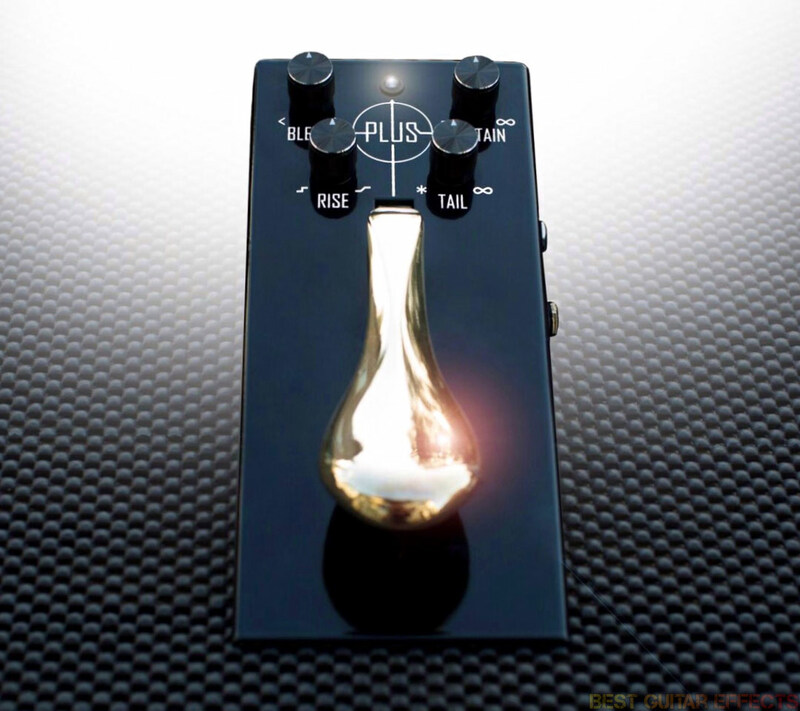 Visit Gamechanger Audio for more info about the Plus Pedal. A great starting point setting for this pedal? *Higher settings will give you a more ambient/spacey sound, while lower settings will give you a more natural/subtle sound. Think of these settings kind of like how you use the settings on a reverb pedal. 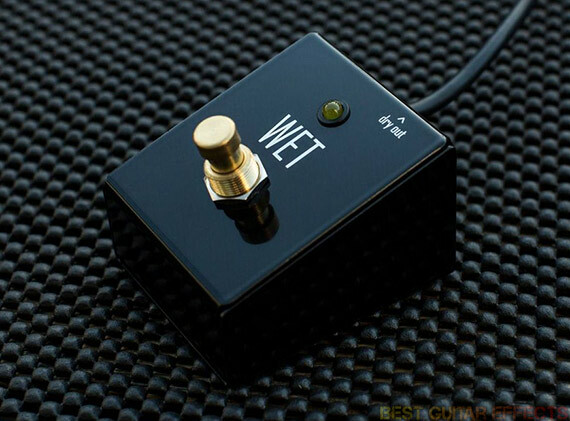 The quality of the wet signal will always be determined by the amount of time between the attack of the note and the time that the foot switch is pressed. For a more synthetic, distorted sound, follow the note attack quickly with the foot switch. For a more smooth, detailed sound, allow more time between note attack and foot switch. 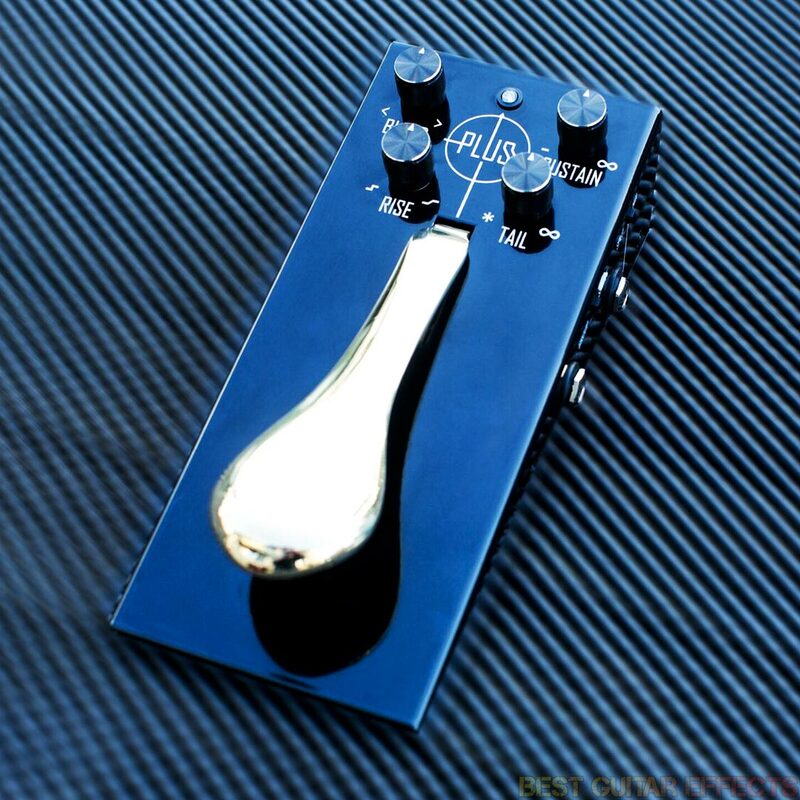 I first saw the Plus Pedal late one night sitting up in bed searching around the far corners of the internet. There were these guys in white lab coats showing off this strange-looking pedal that looked like someone took at piano damper pedal and stuck it on an old wedge-style fuzz pedal enclosure. I thought it was a joke. As soon as I realized it was for real, I was like…. “Whoa……. Someone has actually done it!” Having been a piano player for years before I was ever a guitar player, this seemed like a welcome addition to my board. I’ve always loved the feel and natural simplicity of the piano sustain pedal. It just seems so incredible that someone actually thought to put this into a guitar pedal. Then I started seeing more and more pics of it in some of the FaceBook groups and on Instagram. I recall telling another member of the BGE Team that I thought this might be a contender for Pedal of the Year. After finally using the thing, I can very safely say that this pedal has impressed and shocked me to the core. It is one of the coolest things that has ever happened to my rig. I have used other pedals like loopers, samplers, and synth engines and have gotten similar kinds of effects. The Plus Pedal is just, by far, the most intuitive, simple approach to seamless guitar sampling. I recently chose the Plus Pedal as one of my picks for the Best Guitar Effects Pedals of the Year 2017 article. This little guy was an easy choice to be one of the Pedals of the Year. The very first time I used the Plus Pedal, I realized something had just changed in my life. I struggle to even refer to it as a “pedal”. It’s more like an extension of my instrument than a mere piece of equipment. What makes it so great is a two-fold answer. First, the most obvious thing is the actual pedal/switch/damper. The big brass thing that you step on. It’s just brilliant. This would not be a Pedal of the Year pick for me without that. The operation and the feel of using it – there is no other way to say this, it’s simply PERFECT. The most intuitive thing ever. Everyone knows what a piano sustain pedal is and what it does. The way the pedal is constructed, and the shape of the enclosure makes it very easy to use. I was up and running exactly the way I wanted to be in less than a minute. The second point that makes this a Pedal of the Year is the sound. I have used other “similar” pedals, and the Plus Pedal just has more of an organic, warm sound. The way it naturally rises and falls just sounds exactly like what it does to a piano. As you’re playing, you get this nice washy sustained sound. The first time I plugged it in, I ran a Les Paul into the Plus Pedal into a crappy little amp with a 2.5” speaker. Point is, nothing good in the line to make it sound nice, however, it sounded incredible! I always like to have a reverb in my chain no matter what and using the Plus pedal kind of had that sound. It was like a reverb, and not like a reverb at the same time. It was as if I’d just bought a new kind of a reverb pedal. Something fresh and cool sounding. Using it this way was kind of fun and inspiring. One of my favorite ways of using it is to set the sustain and tail for infinite sustain. You get this beautiful drone sound and you can control the level of that drone with the Blend knob. So wait a minute, this thing can’t possibly get any cooler, right? That’s what I thought but…. There are those that feel the need to really explore every aspect of a piece of gear and try out every single thing a pedal can do. That isn’t necessarily me. I pick things up and when I get them to do something cool I’m pretty much good to go. No need to dive deeper for me. I knew that the Plus had an effects loop, but I didn’t feel like I needed to try it out. Boy, was I wrong. Seriously wrong. As it turns out, I feel like this is the coolest and most usable thing this pedal has to offer! I was so inspired by how cool this was, that I felt compelled to shoot a short video showing what’s going on. You keep your guitar and other pedals and amp plugged into the top-mount input/output jacks as normal. The effects loop is on the right hand side of the pedal – two jacks: send and return. In this loop you place one or more effects. In the video, I placed a fuzz pedal, so let’s talk about that. I think dirt is also a great option for the loop. Here’s what happens as you play. Your guitar signal sounds clean (or however you have it set up); your dry signal is just as though you were plugged into your pedalboard/amp. In my example you’re just hearing a Les Paul clean with just a bit of reverb running into the amp. The fuzz pedal is on, dialed in, and ready to go. As you play, you step on the Plus Pedal and it takes little bits of your signal and sends them through the loop and into the fuzz pedal. It’s just the coolest thing to be playing clean and suddenly hear these nasty fuzz tones slowly fading in and out. The way it builds and decays reminds me of a delay pedal going into oscillation and then fading out. I didn’t have to change a thing about how I was playing, and activating the Plus Pedal was just effortless. Speaking of delay, I also tried a delay pedal into the Plus loop. I had it set up for crazy oscillation thinking I could just punch in some repeats from time to time. What actually happened, in that case, was every time I stepped on the Plus Pedal, I introduced the craziest (not in a good way) sounds. Dialing back the delay helped that out, but still seemed to lack the sounds I was hoping for. I easily got bored with that and ended up going back to fuzz. After all, it sounded killer. Next was the Wet switch. This switch serves as a remote foot controller that bypasses the SPLIT/MIX toggle allowing you to switch in and out of full wet mode on the fly. I tried full wet with both clean and with the fuzz. Cleans felt like I had more control than with the fuzz. Using the pedal this way felt kind of like a Freeze pedal. Really cool to be able to blend layers of just the wet. Another cool trick is to use it as an A/B switch. Set up your signal as normal, and that’s your “A.” Whatever is in the loop is “B” and you can toggle between the two with the wet switch. Set up two completely different sounds and go back and forth between the two with ease. How many pedals out there can do that? The Gamechanger Audio Plus Pedal is a completely new concept that’s perfectly executed, easy to use, and produces beautiful sounding results. After all, in the end, isn’t that exactly what we’re looking for in a pedal? I don’t plan to ever part with my Plus Pedal. It’s going to be one of those things that will be in my studio making things sound their best and proudly on display when not being used. I can’t say that enough; the thing is just beautiful to both the ears and the eyes. It’s one of those things that you want people to see you using. The intuitive design and a near over-supply of sound and routing options make this the obvious choice for a serious musician looking to get something new to come out of their amp’s speakers. Add to that the newly designed science behind the actual sound sampling and you have something truly unique. I can’t wait to see what will be the next offering from Gamechanger Audio. The Plus Pedal is a game changer of epic proportions. 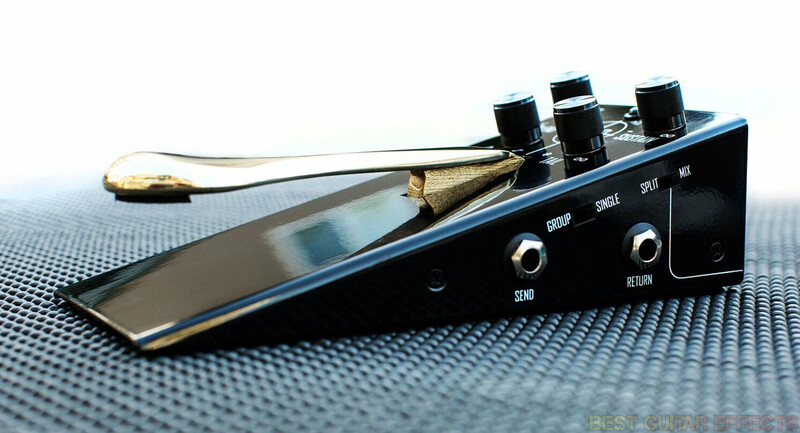 That concludes our review of the Plus Pedal from Gamechanger Audio. Thanks for reading!